Do you have a big job interview coming up? Oh, wait! Is it online? Don’t fret; we got you covered. 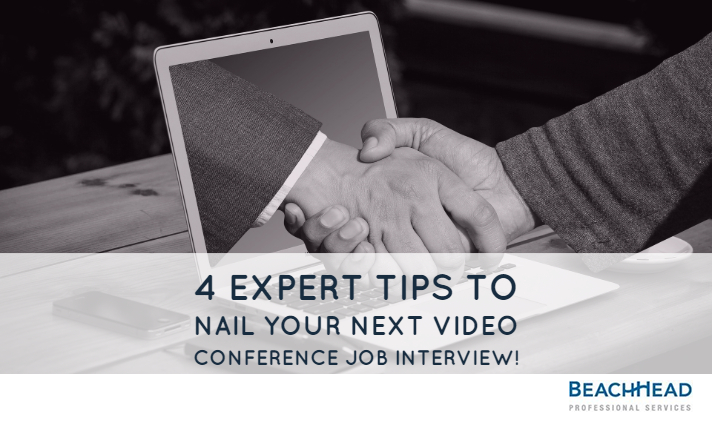 Read on and find out our 4 expert tips to help you nail your next video conference job interview. Video interviews are no longer a rare thing in the recruitment world. Many companies have already incorporated this into their standard recruitment procedures. It helps them better manage the time of their recruiters and hiring managers and is extremely efficient to screen candidates who live far away. If you haven’t encountered any video conferencing interviews yet, we are sure you will see in the near future. It is a good idea to be prepared in advance. Follow these 4 tips, and we’re sure you will ace your video interview like a pro. Imagine a face to face interview, where you’re about to elaborate on a project in front of the hiring manager, and suddenly your kid enters the room crying. You could also be interrupted by your pet or any other family member. Embarrassed yet? Although it doesn’t happen during a face to face job interview, there’s a high probability that you could be interrupted during an online interview, especially if you’ve chosen your home for your interview location. It is therefore really important in these cases that you are in a quiet space with no barking dogs, children, music, or any other disturbing background noise. We recommend that you notify everyone in your home that you cannot be disturbed and lock up your room for the duration of the interview. It is important to choose the background that will be visible to the hiring manager. The best background is clutter free to ensure that you are presented in the best, most organized light. Lots of clutter can easily distract your potential employer. We recommend having a wall or a curtain a few meters behind you so that focus is on you. Also, remember that we want the hiring manager to be able to see you clearly and thus you should pay special attention to the lighting in the room. A dark room will not allow the interviewer to see you and study your expressions clearly. Pay close attention to your body language as it’s very easy to relax and slouch during video interviews. Since you would be taking these interviews mostly from your house or a place you’re comfortable with, slouching, squirming, looking bored, yawning and other things may happen even without you noticing them. But trust us, recruiters and managers will notice. So always treat your interview room as your office and remember that it is a formal interaction. Another thing to keep in mind is the use of hand gestures during the interview communication. We know, we have always emphasized the use of hand gestures, but here we recommend that you keep it low. Using gestures during live presentations and face to face meetings is a must, however, on video they potentially will distract the person on the other line from the message that you’re trying to convey. Be sure to look directly into the camera and smile every now and then. Always dress professionally for your video interviews. Nothing reflects as bad on your professionalism as your choice of attire. We recommend doing some online research about the organization, identifying the corporate culture, and dressing appropriately. While most candidates only dress professionally from waist up, we recommend making sure your complete attire is professional (in case you might need to stand up). We also recommend avoiding bright colors and patterns. Instead, go for soft and solid colors as these will make you look your best on camera and will mostly keep the interviewer focused on you instead of your clothes. It is a must to do a trial run well in advance of your scheduled video interview. Set up your web camera and microphone, just as you would for an actual interview and practice a mock run. If you know in advance, the technology you would be using for the actual interview, try practicing using the same. It helps to create your username and password before the actual day if you can. Also, make sure you double check your internet connection for any possible glitches and interruptions. Always have a plan B ready. With technology, we can never be sure. There will always be a chance that things could go wrong. It is a good idea to have a backup plan in case there is a glitch. We recommend you ask the recruiter or the hiring manager for an alternate number where you can reach them in case the video or audio stops. Keep it handy. You can always call them in case of interruptions and ask them for the scope of rescheduling the interview or possibly finishing it over a call. There you go! 4 key tips from our recruitment experts that will help you ace your next video job interview. Remember, what you say during the interview or don’t say during the interview matters just as much. It suffices to say that treat your video job interview as any normal interview with a few things in mind and you would be good to go. Ready for your next job? Send us your resume at info@beach-head.com and we will help. Remember to like us on Facebook and do follow us on Twitter and LinkedIn. Apply to all our latest job openings here.